Do you have gaps in your teeth or even all of your teeth missing? Are you looking for an option that will look, feel and perform like natural teeth? Having a healthy, beautiful smile is essential in today’s world. We would like to offer an option that may be just what you are looking for. It’s an implant supported denture treatment. Implant supported dentures are permanent dentures. This means that though they are a denture, they are securely placed by attaching to dental implants. Dental implants are a small titanium rod gently placed into the gums and jaw. Within 3-6 months, the rod fuses with the jawbone and creates a “new” tooth root. A dental crown is placed atop the dental implant and this creates a “new” tooth that then provides a base to connect the denture. Depending on how many teeth are missing will determine what type of dentures you will get at our Derry NH dentist office. If you have only some teeth missing side by side, you will most likely get a dental implant on each side of the gap and get a partial denture in between the dental crowns. If you are missing more teeth or even all your teeth, you can get more dental implants and have permanent dentures secured to the implants. 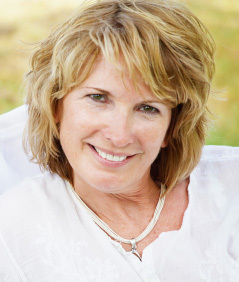 What are the advantages of permanent dentures? Permanent dentures remove the worry, discomfort and limitations typically associated with dentures. 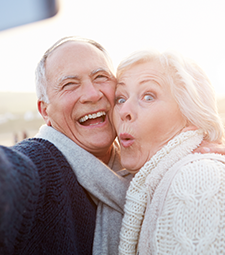 With denture implants, you really do get a permanent set of new teeth! On the first day, we strategically place 4 implants that will secure the false teeth to your jaw. The next day we place the temporary denture on the implants. After the dental implants heal, we place the final permanent dentures. All the while your implants are healing, you have still teeth that you can smile with, eat with, talk with, sing with and laugh with. Implant dentures can give you your life back. For more information about denture treatments including implant supported dentures, call our office in Derry NH near Londonderry and Windham NH today!